Small parts present a challenge for quality control (QC) and production managers of metalworking manufacturers — particularly those in aerospace and automotive applications that demand tight QC at every step of the supply chain. Notoriously hard-to-analyze parts include metal wires, rods and screws as well as other fasteners less than approximately 6 centimeters (2.3 inches) in their greatest dimension, along with thin metal plates and sheets. Many analyzers are not well suited to the task. This can lead to critical problems, including regulatory penalties, a reworking of parts, finished product recalls, or more catastrophic consequences. 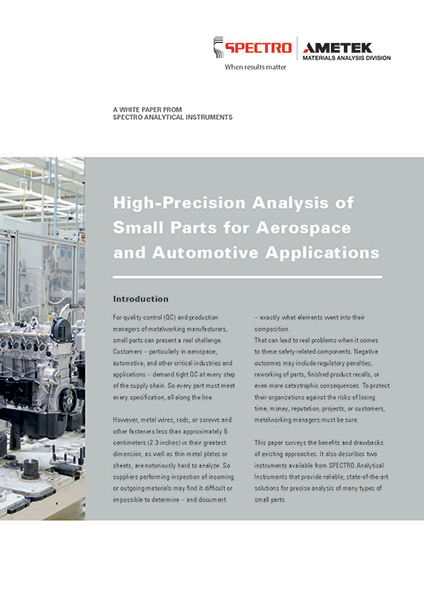 “High-Precision Analysis of Small Parts for Aerospace and Automotive Applications” surveys the benefits and drawbacks of existing QC approaches and examines the advantages offered by new generations of analyzers. It is a guide for assisting managers in determining the best analytical solution for their small-parts testing requirements. Content topics include analytical challenges, conventional analysis methods, sample positioning, calibration and standards, and selecting a small-parts metal analyzer. The paper is immediately available for download at http://bit.ly/2BerPAF. SPECTRO, a unit of the Materials Analysis Division of AMETEK, Inc., manufactures advanced instruments, develops the best solutions for elemental analysis in a broad range of applications, and provides exemplary customer service. SPECTRO’s products are known for their superior technical capabilities that deliver measurable benefits to the customer. From its foundation in 1979 until today, more than 40,000 analytical instruments have been delivered to customers around the world. AMETEK, Inc. is a leading global manufacturer of electronic instruments and electromechanical products, with 17,000 colleagues at 150 manufacturing and sales and service operations in 30 countries around the world. For more information, visit http://www.spectro.com or email spectro.info@ametek.com.